Blog Packing for a plane holiday - is there such a thing as an easy to pack booster? Packing for a plane holiday – is there such a thing as an easy to pack booster? With the summer now upon us many parents are planning what they will pack in their suitcase for the annual family summer holiday; everything they bring will be easy to pack. Given how much luggage a family needs is it any wonder that a travel car booster seat is at the end of many parents list. Indeed many booster seats are so bulky that they are impossible to pack and must be checked as a separate item. The question on many parents minds in such situations will be: is there such a thing as an easy to pack booster seat? The BubbleBum takes up little space and there is no need to check it in separately, your child can even pack it in their hand luggage. 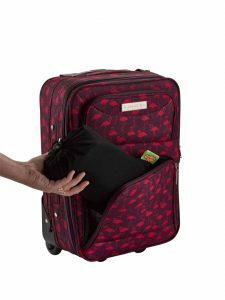 It’s also incredibly light, weighing as little as a packet of biscuits, so it will have a minimal impact on the overall cost of your suitcase! Many parents forget to bring a booster seat on holidays or end up paying extremely high prices to rent them from car rental companies. Some are not aware of the laws surrounding car booster seats for the country they are visiting. At BubbleBum we follow a simple rule; even if your child is not legally required to ride on a car booster seat, it is best practise make sure they have one for every journey, and that includes even when they are on holidays. As every parent knows, the safety of their children is the most important thing in the world. Here are a few other helpful hacks when packing for your littles, number 5 will actually save space in your luggage for that all important BubbleBum Travel Car Booster Seat. Let your child pack their own hand luggage bag with their favourite small items and toys, that way you won’t leave anything behind and tantrums can be avoided. Have a new small toy as a surprise for your little and pack it in your hand luggage, you can then pull out the new shiny toy when your child is becoming restless. Pack your towels and swimming gear on the top of the suitcase, that way if your room or accommodation is not ready when you arrive you can access your swimming gear easy to head straight to the pool, keeping your littles entertained until your accommodation is ready! Try to stay clear of white and light clothes when packing as these clothes will get grubby more quickly and with kids this is inevitable. Nothing will infuriate a parent more than a red ice lolly covering your child’s bright white t-shirt! You should pack more dark clothes than light and denim is perfect for hiding those little grass stains your children will inevitably pick up. When packing outfits be ruthless. Do not over pack but rather bring a few liquid tablets in a small sandwich bag – that way if your kids run out of shorts and t-shirts you can give them a quick freshen up and dry them in the sun. Take the stress out of holiday packing for your family and be organised and don’t bring anything you may not need! As an added benefit, you can even click and collect your BubbleBum Travel Car Booster Seat at Boots in many airports throughout the UK!